The Fangshi Xingyu 2x2 is Fangshi's second 2x2, does it live up to Fangshi standards? The Fangshi Xingyu is fast but controllable even for a beginner. It has a nice crisp feeling. The corner cutting is very good for a 2x2. Even on stock tensions. Since this is a 2x2 it doesn't corner twists. The shades are vibrant and are long lasting. The only problem I could find is slight catches when you turn fast. 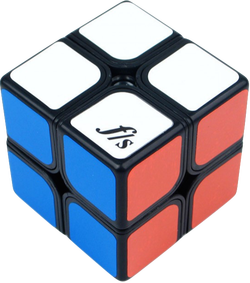 The new 2x2 from Fangshi is a great cube. Out of the box, it was quite fast, and the stock stickers are actually quite good compared to old Fangshi stickers. After breaking it in and lubing it, the XingYu is very fast, and is easily one of the fastest 2x2s on the market. Lockups are fairly rare due to its corner cutting, which is up to 45 degrees and 2/3 of a cubie reverse. Corner twists are really never an issue on 2x2, so I won't be covering that. The XingYu essentially uses a standard Fangshi 3x3 mech for the 2x2 core, and as such, does not pop at all. The only downside I would expect from this cube are that it does feel a bit flimsy and unstable, and the feeling of the cube while turning, which is crunchy and quite loud. This cube is fast and semi scratchy like other Fangshi cubes. OOTB it wont cut 45 and is a bit catchy, but after some breaking in and lubing the core/pieces it completely changes. I don't know if it beats my Zhanchi, but it is definitely up as one of the best 2x2s on the market.